Imagine playing the parts of four instruments at once in what appears to be a typical Rock Band setup, only you're using a normal game controller and you're doing it by yourself. That's Rock Band Blitz, the downloadable title announced by Harmonix earlier today. The announcement trailer above gives some indication of how the game will be played, while it's not being obscured by the enormous signs that pop up over the action again and again. Each track has two input cues on it, and the tracks are split four ways across unique instruments. 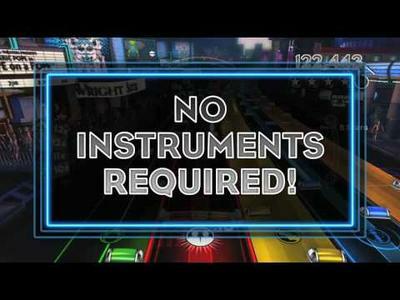 Rock Band Blitz is a new way to experience your favorite Rock Band songs, with fast-paced, multi-track arcade gameplay that encourages you to compete against your friends for the highest scores. Use insane power-ups like the note-obliterating Bottle Rocket or the Pinball strategically to boost your scores and top the leaderboards! The game will feature more than 20 tracks at launch. The songs (like Blink-182's "Always," Foster the People's "Pumped Up Kicks," Quiet Riot's "Metal Health (Bang Your Head)," and Rick Springfield's "Jessie's Girl") will be completely new to the Rock Band franchise. Once you buy Rock Band Blitz, all 20 of those extra tracks will be immediately playable in Rock Band 3. Rock Band Blitz will launch for the Xbox LIVE Arcade and PlayStation Network this summer. The game will be playable at the PAX event in Boston this weekend. As more comes, we'll have it.